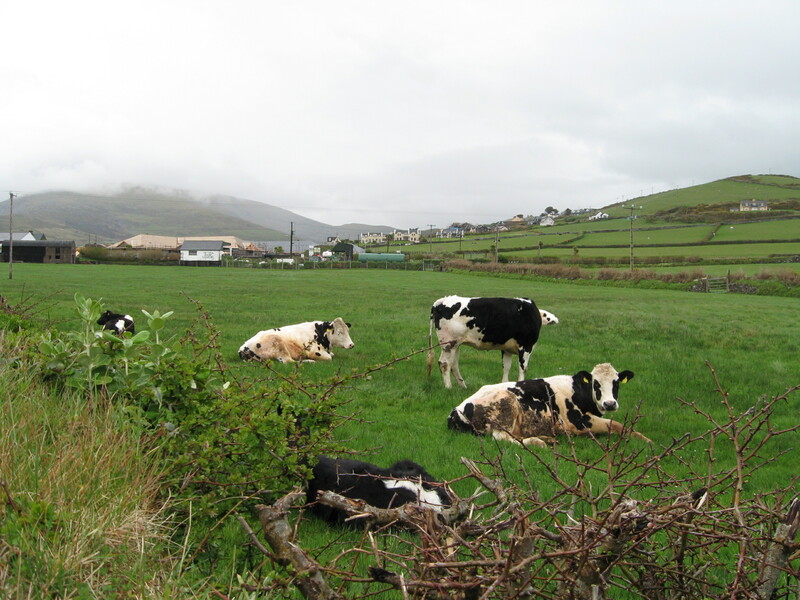 This is Dingle, possibly the cutest little place ever with many happy cows. 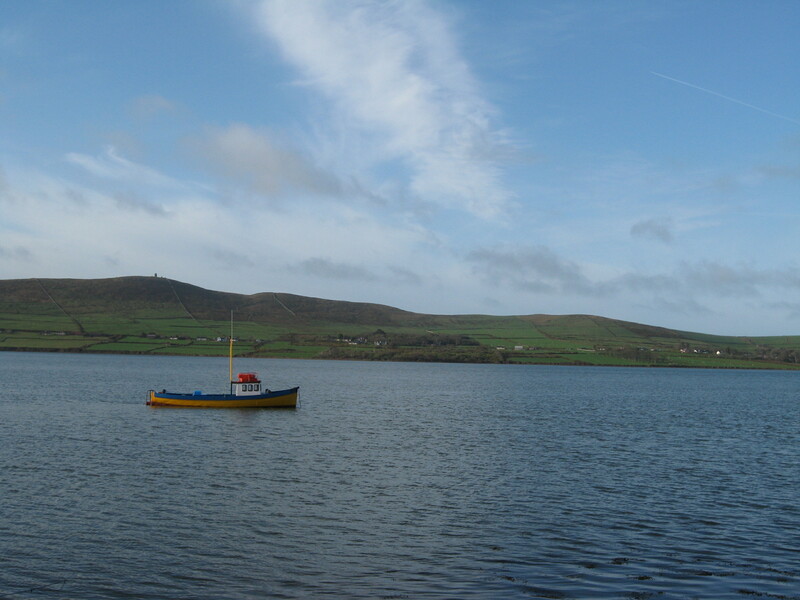 Dingle first made the history books when, in 1257, King Henry III decided to impose taxes on exports from the port. Through the 16th century, the area had a strong trading relationship with Spain. In 1588, a ship from the Spanish Armada sunk off just off the peninsula’s coast. Oops. 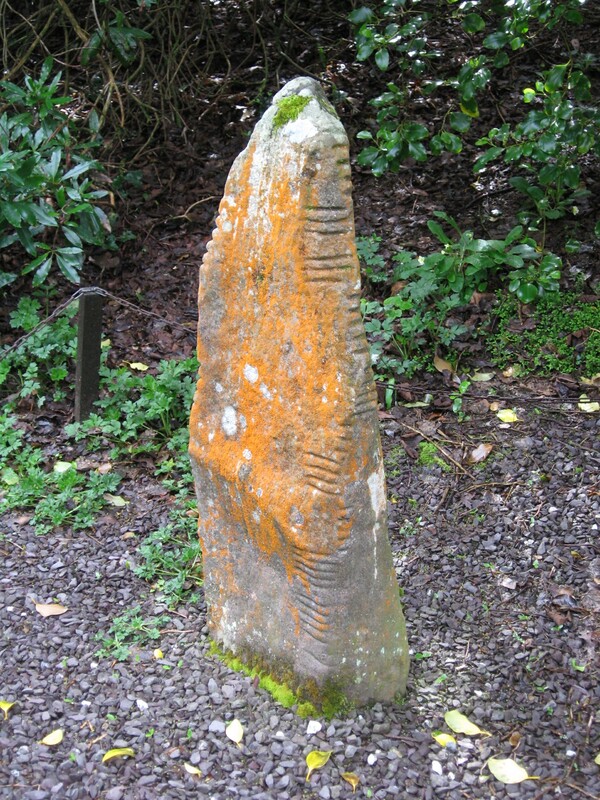 Going around the peninsula, you’ll see sights like this Ogham Stone. The tick marks along them are an ancient form of writing. The people who wrote them may have lived in the stone beehive huts you’ll see in the very center of the second photo. 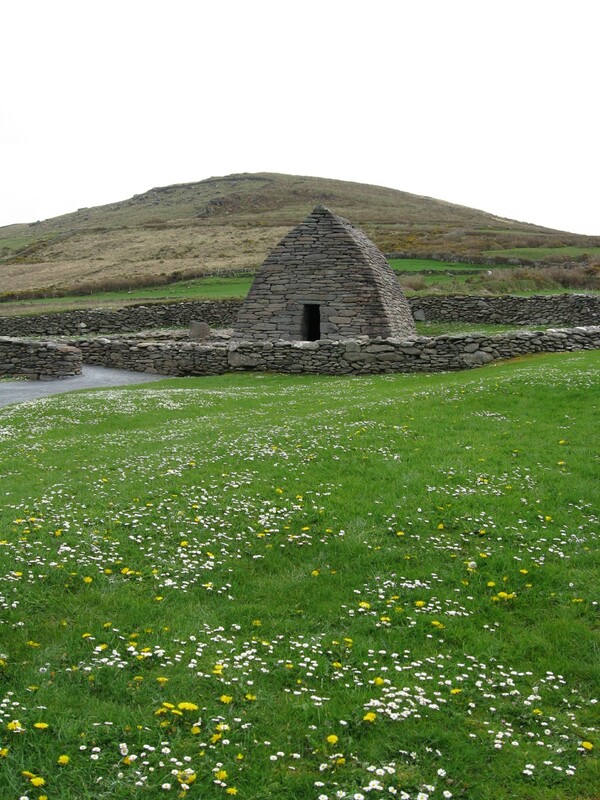 These huts are over 4000 years old (according to the tour guide), but early Irish monks also built beehive huts in the 5th-sh century to get away from it all. Beehive structures can be found at various monastic sites (sort of like cloisters) once the monks decided they didn’t like living alone all that much. I think it says, “Eat at Joe’s,” but I could be wrong. 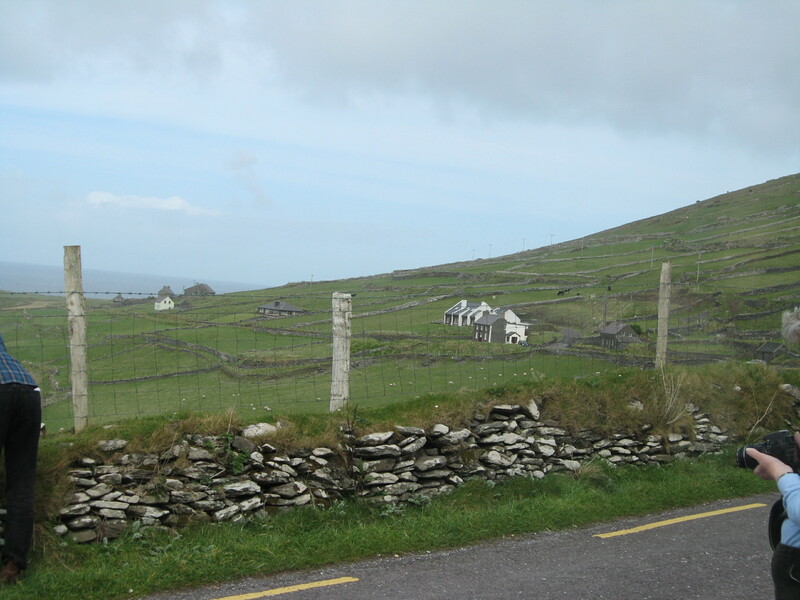 Traveling along, you come to the tip of the peninsula called Slea Head. 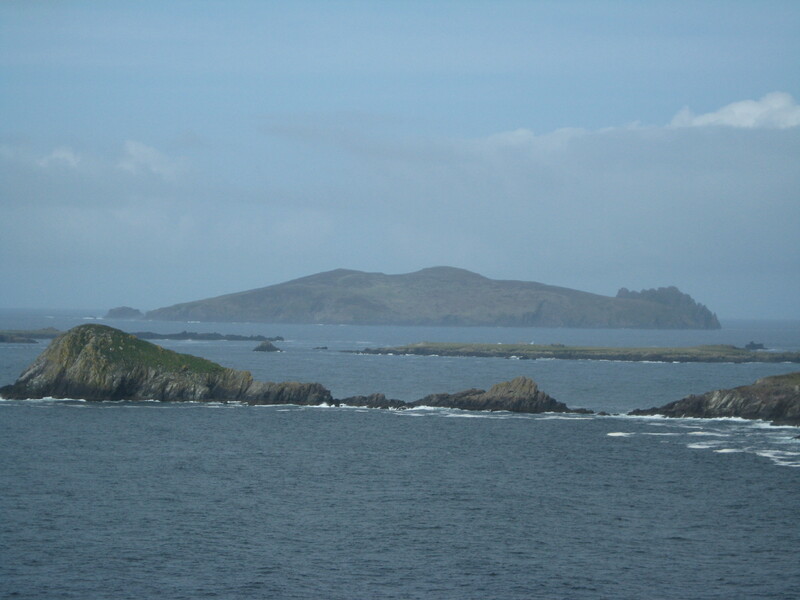 A couple kilometers off the head is a group of islands called the Blasket Islands. The island that looks like a man lying on his back is the Great Blasket. 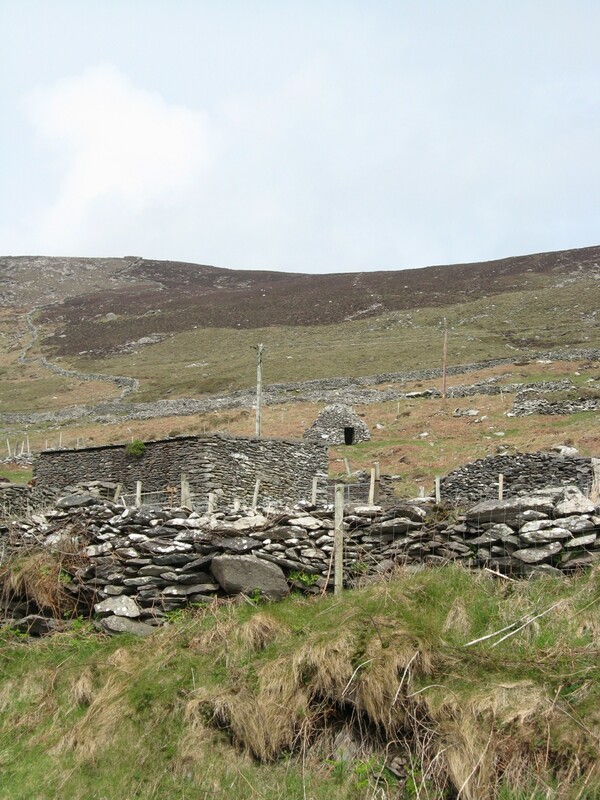 These islands were inhabited until 1953 when the Irish government forced the residents to evacuate permanently. Apparently, the government got fed up with having to answer emergency calls when the islands were cut off during heavy storms. In good weather, you can take a boat over to visit the islands. 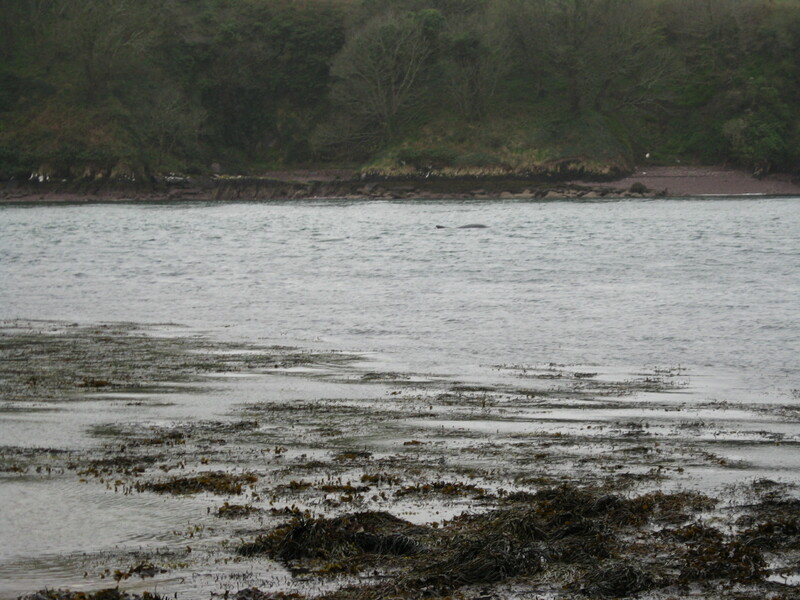 Of course, you’ll have some lovely scenery as you explore the peninsula. It’s Ireland, after all. 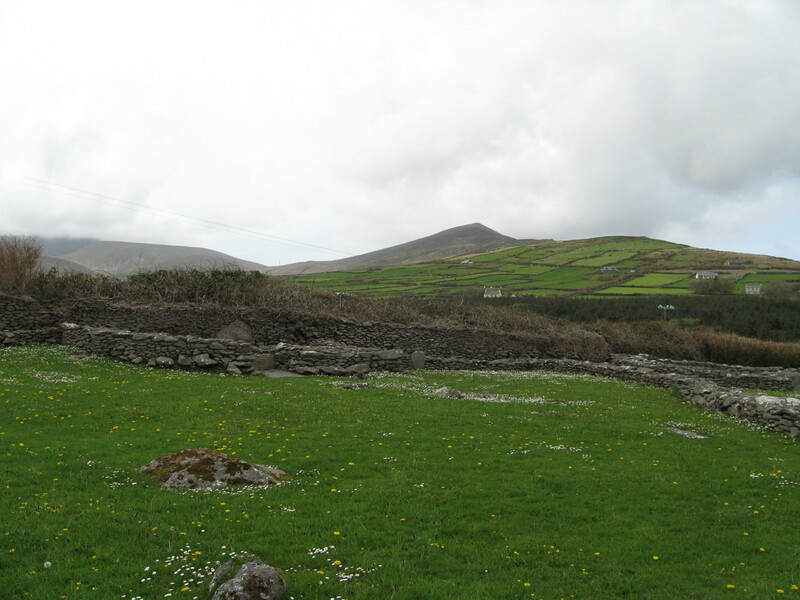 On the opposite side of the peninsula from Dingle town, are the ruins of the Riasc Monastery. This stone monastery dates from the 7th century CE. 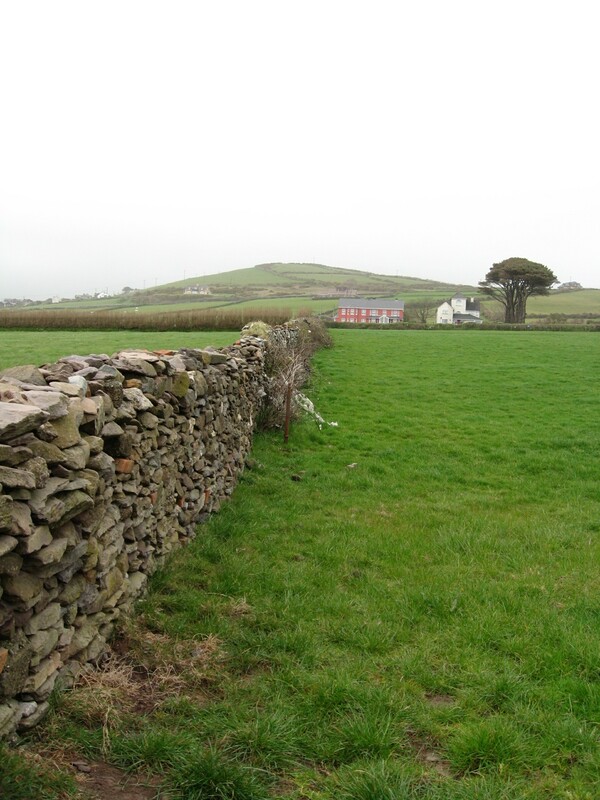 When archaeologists first started excavation, all that was visible was the tip of the stone marker in the first photo. Enough of the stone was exposed that they could see symbols on it and, since archaeologists love their symbols and always have shovels that need to be used, they set to digging. The site consists of portions of the walls of the monastery (as seen behind the stone marker) and circular structures that may have been the monk’s cells. Portion of the monastery’s outer wall. Like much of Ireland, Gallarus Oratory is quite photogenic. Back in Dingle, you need to take some time to see the town’s most famous resident, Fungi (or Fungie, or Funghi, depending on your preference). Fungi showed up in 1983 and decided Dingle was so lovely, he wanted to stay. He followed fishing boats because he knew he could get an easy snack. The tour boats are not allowed to feed Fungi, so the fact that he still follows the boats around is kind of cute, but also a little sad since dolphins are social animals and these boats seem to be his only friends. Still, no one is making old Fungi stay. Now, you can pay around $25 to take an hour-long boat ride to see the dolphin, or you can talk to a local who will tell you the secret spot to go where the dolphin will come to check you out. I’m not kidding, when my husband and I were there, we had barely been to the spot for five minutes before a dolphin (sorry, he wasn’t wearing a name tag, but we just assumed he was THE dolphin) swam rather close to shore, checked us out, and then lingered around the area for a bit before heading off to do whatever it is he does. The dark spot toward the top center is him swimming away after his visit with us. 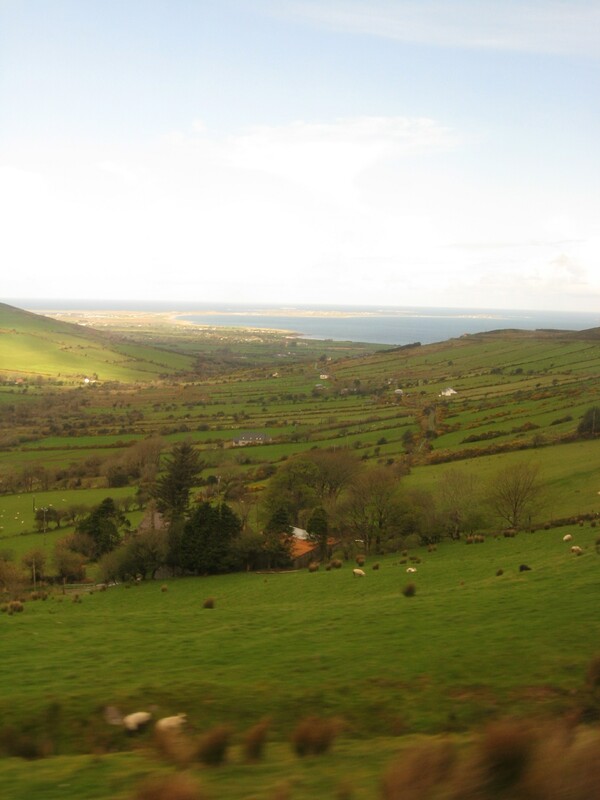 To get to Dingle by public transport, you need to take Bus Eireann to Tralee. 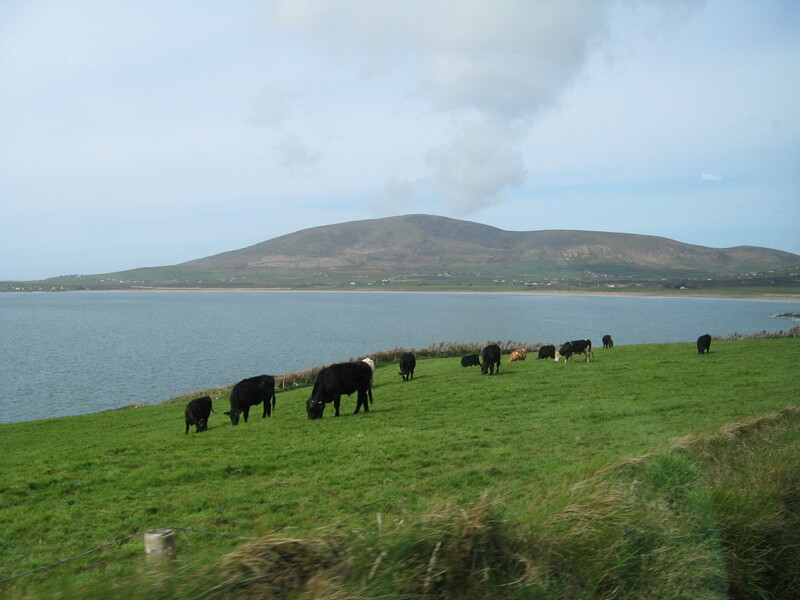 From there, not-so-frequent bus service (runs every 2 to 4 hours) will take you to Dingle. The trip takes about an hour and 20 minutes along a scenic yet VERY narrow (and twisty in places) road. Great fun if you’re not driving! Yes, it does get sunny in Ireland…usually when you’re on the bus. 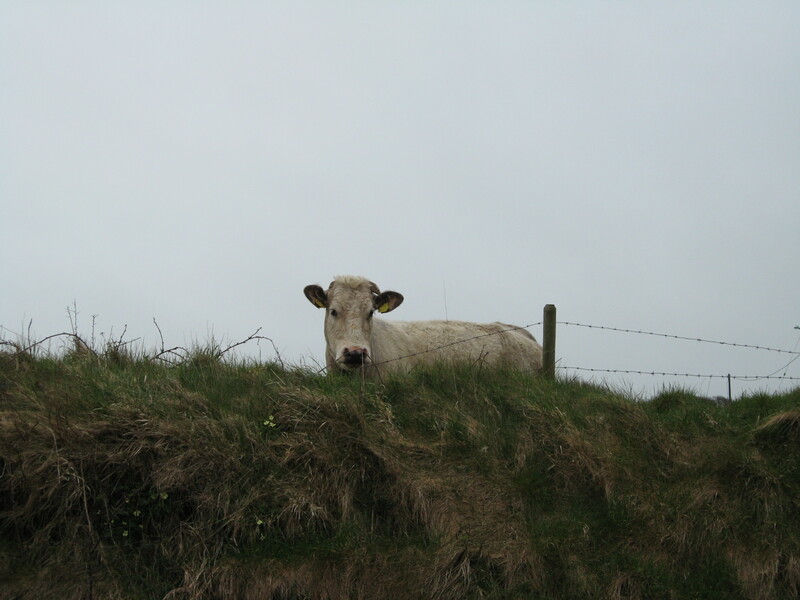 I loved staying in Dingle. 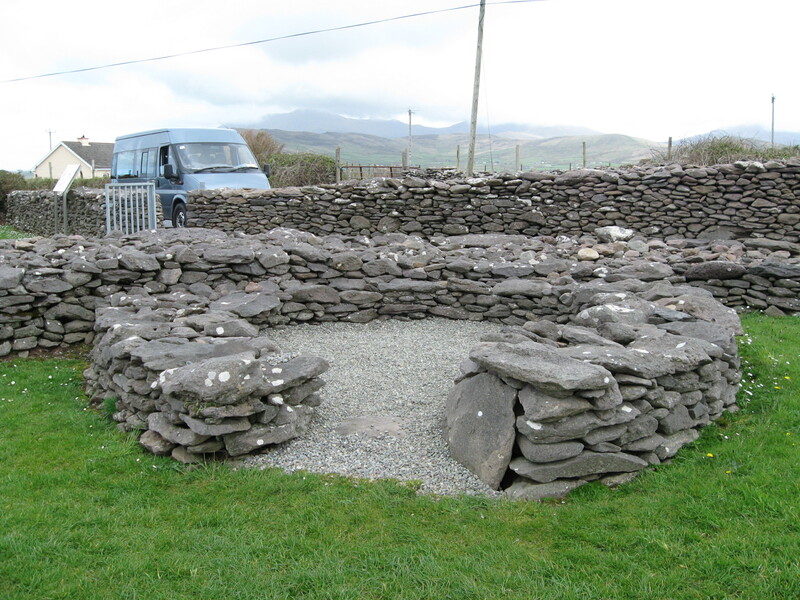 My favorite thing about the area is Gallarus Oratory. 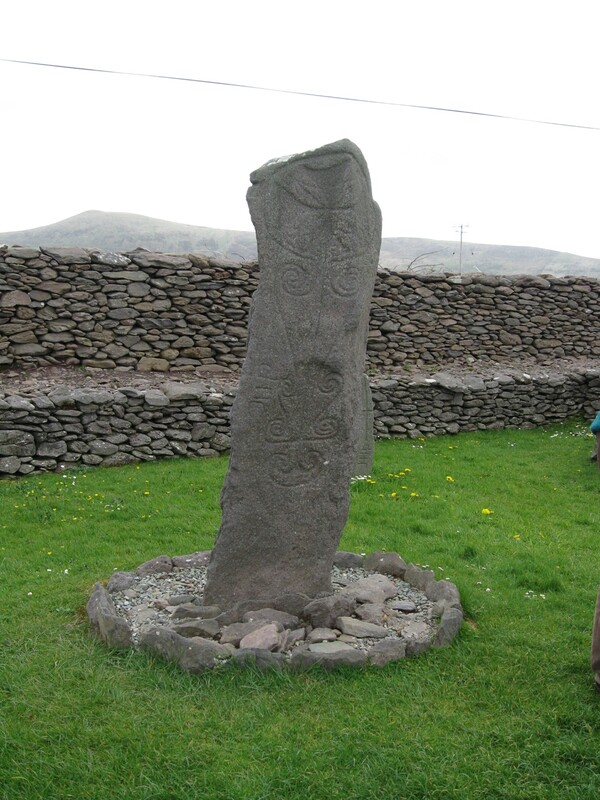 It’s amazing to think it’s just a dry stone building and has been standing for about 1600 years or so. I wanted to visit the Blaskets but the weather was a bit rough for the boats to cross the channel. While there I bought a great book about life on the Blaskets. It’s called “The Islandman” by Tomas O’Crohan. One tip–don’t wait ’til Sunday to try to rent a bike, all the bike rentals were closed. Isn’t everything closed in Ireland on Sunday?